"Our aim is to create an island of tranquility in our own country which, amid the joyful hum of arts and crafts, would be welcome to anyone who professes faith in Ruskin and Morris." The Wiener Werkstätte (Viennese Workshops) was one of the longest-lived design movements of the twentieth century and a key organization for the development of modernism. Centered in the Austrian capital, it stood at the doorway between traditional methods of manufacture and a distinctly avant-garde aesthetic. The Wiener Werkstätte's emphasis on complete artistic freedom resulted in a prodigious output of designs, and this, along with an army of skilled craftsmen and a complex network of production and distribution made it the standard for Austrian design between the dawn of the century and the depths of the Great Depression. Led by the unassuming architect Josef Hoffmann and his associates such as Dagobert Peche and Koloman Moser, the Wiener Werkstätte drew from movements such as the Arts & Crafts and Art Nouveau as well as from traditional folk art, and forecasted the flowering of Art Deco and the International Style in the interwar period. Its demise in the midst of repeated financial crises demonstrates the ultimate inability of artistic enterprises to completely free themselves from the economic concerns of the age. The Wiener Werkstätte was the first organization in Austria dedicated to the production of modern decorative arts. Together with the Vienna Secession, out of which it was formed, it broke away from the stylistic revivals that had dominated Austrian architecture and design during the 19th century, though eventually it returned to historical tropes when new designers joined the group in the 1910s. The Wiener Werkstätte initially emphasized the creation of the Gesamtkunstwerk, or "total work of art," that sought to create a unified aesthetic across an entire designed environment, though this effort eventually fragmented into a highly diverse set of fields, with less and less emphasis on architecture and large-scale interiors, largely due to the financial constraints of the group's clients. The Wiener Werkstätte innovatively envisioned that many of its activities would complement and promote each other - for example, its postcards often featured the Workshops' output in architecture, textiles, fashion, and glass and ceramics - a move that helped Werkstätte attain two of its goals: first, narrowing the gap in prestige between artistic genres; and second, bolstering the commercial visibility of its designs. Unlike other contemporaneous movements in the decorative arts and design, the Wiener Werkstätte did not seek to create an art that would be accessible to all and enlighten the masses; instead, the group focused on the highest quality craftsmanship and materials for a socioeconomic elite that, perhaps ironically, would treat its work more as art objects than utilitarian items. Translated as the "Viennese Workshops," the name Wiener Werkstätte represents well the nature of its organization: it incorporated the craft-based production of decorative arts in a mostly rural country, which was historically concentrated in its primary metropolis. Though its artists made ample use of new industrial materials, they resisted temptations to completely turn to mass production. The artistry of the Wiener Werkstätte always took primacy over the commercial bottom line of the enterprise, and its reliance on wealthy underwriters to sustain its activities contributed to its gross financial insolvency. This, exacerbated by periods of broader economic troubles, was primarily responsible for its demise. Raging against "The boundless evil caused by shoddy mass-produced goods and by the uncritical imitation of earlier styles," Koloman Moser and Josef Hoffman founded the Wiener Werkstätte as "an island of tranquility..amid the joyful hum of arts and crafts." The Palais Stoclet represents the ultimate environment envisioned by the Wiener Werkstätte, as the cooperative received the commission during the brief period when Hoffmann had formally merged his architectural practice with the Werkstätte's activites. The program consisted of a palatial residence for the wealthy Belgian banking and railroad magnate Adolphe Stoclet, who in 1904 had just inherited a vast fortune from his late father, and gave the Werkstätte carte blanche. Hoffmann designed the house to maximize the two long facades: from the street it appears as an austere, stately urban mansion set amongst a verdant environment, with a formal covered pathway leading to the main entrance, while the rear, which opens onto a park, and onto multiple levels of terraces which facilitate several different views of the landscape. The greater importance of the Palais Stoclet, however, lies in the interior, where Hoffmann and his associated artists used the most expensive materials available - gold, precious stones, rare woods, leather, and marble, among others. The key space within the house is the dining room, where Gustav Klimt - whose independent commissions separate from the Werkstätte included several portraits of the group's most enthusiastic patrons - designed a mural that wraps around three different walls. The mural shows a sprawling tree of life motif flanked on one side by a woman and the other by a couple in embrace; the characteristic panels of gold and other colors almost dissolves the figures into an abstraction that mimics the geometric patterns and panels of the rest of the room, including the furniture. The angularity, regularity, and severity of the geometries inside the house, combined with the luxurious tastes of the client, suggest the move in the years immediately preceding World War I to a craft-like, nearly Cubist ostentation that forecasted the emergence of Art Deco in the years following the conflict. 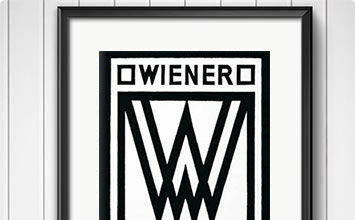 The letterhead of the Wiener Werkstätte must have appeared startlingly modern for its time. In contrast to most organizations, whose letterheads frequently used intricate pictorial graphics of their factories and ornamental script-like or serif typefaces, the bold geometry, clean lines, and simplified lettering of the Werkstätte speak to a precision and straightforward approach to their work. The individual sections of the design are ruled by an overarching, repetitive set of boxes and borders, which use the exact same line weights as the arms of the sans-serif lettering. At the top left, one notices the interlocking "WW" logo of the Werkstätte, which almost completely blends in as if to demonstrate that its form is the "generator" from which the rest of the design proceeds. The design thus uses a regimented order that mimics the uses of the forme and chase in manual printing-press typesetting. This is highly appropriate, as it arguably references the hybrid-like manner in which the Werkstätte functioned as a massive, craft-based workshop that nonetheless could not completely escape the use of mechanized production (as demonstrated by its furniture). Even nature itself, as suggested by the flower-like bloom on the right side of the letterhead, is abstracted - a further revelation of the hand of the artist - but also uses the same regimented boxes that reference the role of machine production. In the broadest sense, the letterhead also indicates the impressive range of media in which the enterprise worked (especially in contrast to the massive tectonic scale indicated by the Palais Stoclet). More specifically, on the other hand, it demonstrates the seamlessness of the Werkstätte's graphic design, on multiple levels. This design, for example, resembles closely the layout of the address sides of the group's postcards. The Sitzmaschine ("sitting machine") chair, originally designed by Hoffmann for the Purkersdorf Sanatorium, a sort of combination hospital/spa resort, is the best-known piece of furniture produced by the Wiener Werkstätte. Its significance lies in the way it honestly discloses both function and construction without sacrificing aesthetic appeal. The legs and arms unite in dramatic curves that almost seem to suggest the forms of wheels of a machine itself in motion. Though the chair is pierced by gridded and slit-like openings, none of the lines or edges end in sharp corners, instead being rounded, which further underscores the notion of a well-oiled, harmonious machine. The exhibition of function, meanwhile, is evident in the set of balls on the back of the arms, which support a transverse bar behind the back and can be adjusted for different gradations of reclining for preferred comfort. The chair's association with the machine is further extended with the choice of materials, as it uses bentwood for the curved pieces, a significant instance where the Wiener Werkstätte bowed to the dictates of mass production. It represents as well a specific instance in which Austria could claim technological innovation, as the process for making bentwood were perfected in the 1830s and '40s by Michael Thonet, a German manufacturer who moved his operations to Vienna in 1842. The Werkstätte outsourced the manufacturing duties for this chair to Jacob and Josef Kohn's firm, which, along with Thonet, was one of the primary companies used by the Werkstätte for furniture production. Nonetheless, for all its associations with utility, the chair is notorious for being anything but comfortable for its sitters. It thus reflects the nature of Hoffmann's design practice, wherein function was usually sacrificed to aesthetics when it became impossible to accommodate both. Hoffmann's designs for dining utensils also constitute some of the most recognizable items that the Wiener Werkstätte produced, able to be located in many museum collections in Europe and North America. This design exudes a rare sense of pure functionalism for the first decade of the new century, but one which is appropriate for the initial client of this design, the industrialist Adolphe Stoclet, whose business interests had to reflect a certain efficiency in order to be profitable. Reintroduced by Alessi in 2015, this flatware line shows the simplification of the forms to their most essential characteristics: only handles and utensils, stripping away any extraneous ornament. The cylindrical shapes of the base of the handles of the forks and spoons taper to a thin flat plane as they reach the tongs or bowls, thus indicating the seamlessness between the hand of the user and the purpose the flatware serves. The only suggestion of decoration is the square incised at the base of the handle like a stamp that surrounds two W forms, indicating the items' manufacturer with an absolute minimum of required work. The clarity of form and identification thus disclose the fineness of the craftsmanship to which Werkstätte artists aspired. Ironically, the sense of efficiency that the utensils exude did not match the nature of the Werkstätte's design process, where organizational inefficiency and complete artistic freedom often contributed to wasteful expenses for materials and labor. This design by the Czech artist Moriz Jung is one of the Werkstätte's most famous postcards, whose subject matter, like many of its sisters, is probably most significant due to the way it situates the Workshops firmly within the realm of Viennese municipal culture - in this case, the famous Vienna coffee house. In fact, due to the geographic specificity of their subjects, the Werkstätte's postcards perform this task of rooting the group in the city more effectively than any other type of item it produced. The archetypal Viennese coffee house, whose form and function were well-established in the early-20th century, serves even today as one of the loci of the city's intellectual activity, acting as a kind of great reading room serving its eponymous drink to those who tend to linger for hours while working, discussing, or digesting a great number of newspapers. The postcard's imagery shows a caricatured example of one of the numerous writers - many of whom in real life were considered some of the most prominent Austrian intellectuals - who often inhabited the coffee house for long hours. He is slumped, presumably in a stretch of rumination - as suggested by his gaze to the space beyond the viewer - before putting the pen on his table to the paper nearby. His clothes, like his face, are rumpled in a way that suggests his intent concentration only on the work before him, and he sits on one of the high-backed upholstered seats covered in bright floral patterns, perhaps like those produced by the Werkstätte itself. Textiles and clothing form important parts of the surviving Werkstätte items available today, as several museums conserve considerable collections of the enterprise's fabric swatches and samples. While this is fortunate for research purposes, the wide variety of patterns make it difficult to choose a single object as representative of the Werkstätte's work as a whole. This dress, however, holds special prominence as a favorite of Friederike Maria Beer, one of the Werkstätte's most devoted patrons, who insisted that Gustav Klimt depict her wearing it in a 1916 portrait (a commission otherwise unrelated to the Werkstätte). Indeed, the portrait reifies the design to a level of immortality: everyone who owned one could thus imagine herself as dressing in a Klimt painting. The dress, created by two of the Workshops' chief fashion designers, represents some of the Werkstätte's innovative ideas about female fashion. Its irregular pattern of curved lines and regions, which requires one to look closely in order to detect the repetition within, also functions to obfuscate the actual shapely curves of the person wearing it. The free-flowing nature of the pattern also reflects its very nature as an "afternoon dress," not intended for formal events, but for casual and carefree occasions. The colors of cream, blue, and tones of gray, together with the pattern, also abstractly recall the idea of running water tracing over and dripping from the contours of the human body, or the rippling of bodily forms like hair due to wind, thus deftly adding a layer of sensuality to a garment that otherwise conceals nearly the entire figure. Glassware formed an essential part of the Werkstätte's production from the outset, and remained as such until the Workshops' closure in 1932. Like textiles and clothing, Wiener Werkstätte glassware is so varied as to preclude easy choices to represent all its pieces. This cup, however, is significant on several levels. First, it illustrates the collaborative nature of much of the Werkstätte's designs, as Josef Hoffmann was responsible for the shape of the vessel and Mathilde Flogl, one of the Workshops' important women artists, completed the decorative painting. Also importantly, one can also quite clearly see the enormous influence of Dagobert Peche on other designers some three years after he joined the Werkstätte: here Hoffmann has abandoned the strict geometries characteristic of his architecture and design for the applied arts between 1900 and 1915 in favor of a more decorative set of concave and convex profiles, particularly in the stem and base, but also in the flared lip. These recall the forms of Baroque and Rococo designs, and are highlighted by the way that Flogl has chosen to paint the lower half of the vessel in the alternating white and blue stripes. Flogl's decoration of the actual cup, meanwhile, is highly fanciful, mixing forms of birds, humans, potted plants, and deer with abstracted curves and twisted lines in a non-narrative manner; it likewise recalls the work of Peche, such as the gilt jewel box of his from two years later. The simplified forms, floating almost randomly on the surface of the vessel, seem to ask the user to choose or fashion a connection between them purely from the imagination, and perhaps serving a potential utilitarian purpose as a conversation starter over a drink. In some ways, therefore, they anticipate the developments of both Surrealism and German Expressionism during the 1920s. This silver jewel box is exemplary of Dagobert Peche's creative work for the Werkstätte, which dazzled Josef Hoffmann and his colleagues from the moment that they met Peche in 1911. The box uses the motifs of a deer frolicking amongst grapevines, with the ground it stands on serving as the lid of the container. This is, in turn, perched on top of four pine cones that both serve as the legs and contain individual storage containers themselves - thus exhibiting the piece's ultimate utility. The curves of the deer's body and the vines and the deep ridges of the surfaces of the container recall the exuberance and ornamental qualities of Baroque and Rococo design, exhibiting a sharp contrast to the severe abstracted geometries of Hoffmann's early work. The jewel box's artistic qualities exhibit several ironic twists: while the piece ostensibly functions to protect and guard valuable stones or other objects, its own precious materials and craftsmanship also rival whatever might be stored inside. On one level it only magnifies the precious nature of what it contains, both in the way the gold conceals the silver and the way it encapsulates other desirable objects. On the other hand, the valuable exterior means that it arguably ceases to perform its intended function and becomes its own precious object requiring proper safekeeping. The ultimate significance of the case, thus, might be that it subverts the honesty of construction and function common to modern architecture and the applied arts in favor of an increase in its fetishistic qualities. This aspect, along with the box's highly exuberant forms, presciently forecasts the emergence of Art Deco and the materialistic values that characterized the culture of the Jazz Age over the coming decade.